A mock crash at the Mt. Abraham UHS safety fair. Photo by Leeya Tudek. If you’re reading this, we’re guessing you have a special interest in the futures of a whole lot of high school students. So do we — a hope that each generation will make safe decisions behind the wheel and in life in general, and that every decision made will have at its core a sense of responsibility and compassion for others. Vermont is a community that works together and celebrates our successes together. We know how important it is to recognize the unique value we each might contribute to a cause, and we’re entrepreneurial enough to harness our many talents to make good things happen. 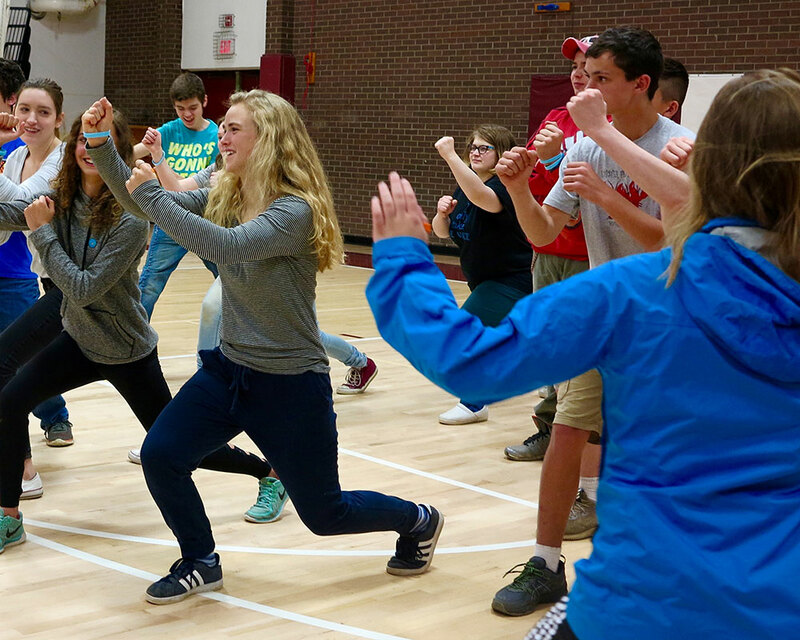 This guide is an overview of one of those special efforts that brought Vermonters together from across the state to share a message with high school students, a whole campus at a time. 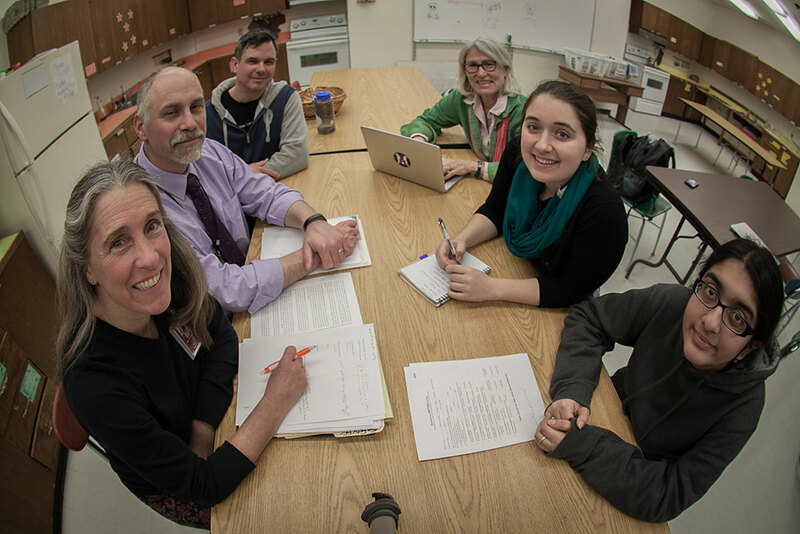 It was an effort that we hope will be duplicated by other high schools in Vermont, until our students are all creating a more conscientious and safer culture. Starting in 2016, the faculty, students, and administration of Mt. Abraham Union High School in Bristol began meeting to plan a campus-wide day-long safety fair. Everyone involved knew they’d be learning as they went along — that it wasn’t clear how to materialize such a big project that would bring so many presentations, workshops, and displays together at one time. It was important to everyone that when it was accomplished, our experience should be shared — our insight should help every other school with a head-start and confidence to create similar fairs, and generate the same benefit for hundreds more students each time it happened. Our goal was to write it all down and share it with you. The fair was held on May 5, 2017 and what follows is a ‘how we did it so you can, too!’ guide. This guide coincides with a list of safety presentations that are available for free, with many topics and from all areas of the state. The directory and how-to guide are projects of the Youth Safety Council of Vermont and are made possible with the partnership of Mt. Abraham Union High School and support from the Vermont Highway Safety Alliance. A lot of information will follow in this guide, but the most important first steps are to form a planning group, set a date, and let the campus community know about it. Our planning group included teachers and student advisors, administrators, and students. 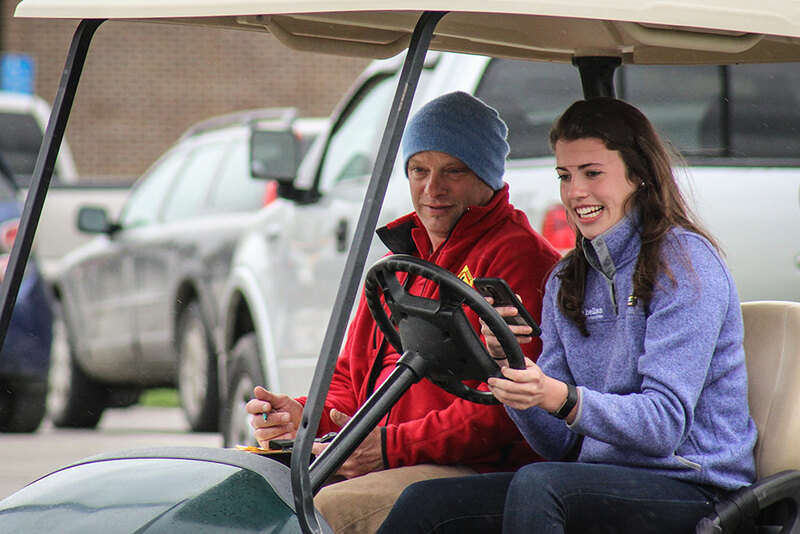 Each brought a different kind of experience to the conversation — some could connect the safety fair to curriculum; some could reach out effectively to the local community; some knew how to make a school-wide program function smoothly. Students helped make sure the fair was not just an honest effort to capture attention with an important message, but an effective one, too. Members of the Mt. Abraham safety fair planning group: Clockwise from left, Sharon Koller, Student Assistance Program Counselor; Kevin Masse, Driver Educator; James Lockridge, Executive Director, Youth Safety Council of Vermont; Anne Friedrichs, Social Studies Teacher; Siena Hoaglund and Satinder Pabla, students. Our planning group started a year in advance and met 15 times during the school year for an hour each time. Our commitment paid off with an event that had a scale and success we were proud of. We met frequently because we were developing a prototype, and wouldn’t need to meet as often the next time we produce a fair. Your own project might be bigger or smaller than ours. Hopefully this guide will help you set a timeline for yourself that makes sense for your unique event. Choosing the date of the fair at the very beginning is a sure way to keep your focus on what needs to be done. “As a school community we need to understand that the concept of safety needs to be taken in many directions. Without a safe educational and living environment humans can’t learn and thrive.” — Jessica Barewicz , Principal, Mt. Abraham UHS. Vermonters care a lot about each other and this is especially noticeable in our safety community. All across the state there are organizations, businesses and programs that try to make Vermont safer for everyone. Many offer the gift of their resources and experience, bringing presentations or workshops to schools that invite them (like yours). A list of many of these generous safety programs can be found here. At Mt. 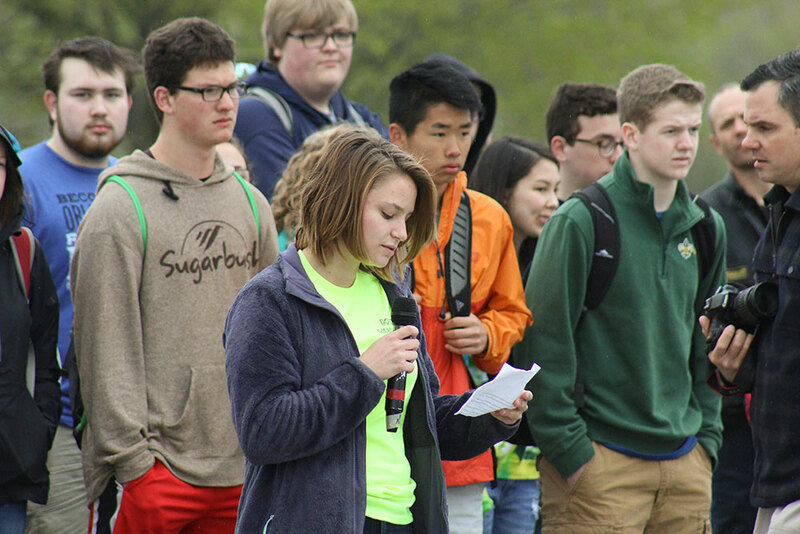 Abraham, our safety fair included information tables; individual speakers; workshops in classrooms by experts and safety advocates; presentations and experiences that were both indoors and outside; and a student assembly with brief speeches and prizes. It combined organizations that were local and from across the state. The variety made it interesting and gave us a program that students could move through during the day, all over campus. With displays, presentations, and hands-on workshops, a safety fair can introduce students to new and diverse knowledge. Photo by YSCVT. Some of the presentations were interesting and gave insight about how the real world works. Some presentations were emotional personal stories about losing loved ones in avoidable crashes. The safety message had a chance of being heard by students who respond differently to different messengers. Our team felt strongly that our local community should play a big role in our safety fair. We wanted our students to understand that their community cares about them, and that local neighbors and friends even dedicate their professional lives to the health and safety of our students. First responders including police, fire and rescue squads were prominent in Mt. Abraham’s fair program. What follows in this guide is a big checklist. Some of the items, like building a confirmed list of the workshops and presenters, will happen in an ongoing way with progress made between each planning meeting. We can offer an overview, but your planning group will need to set its own goals and pace of progress and record-keeping. We chose to keep our documents, like minutes of our meetings and this team-coordinating document, on Google Drive so we could all share and contribute to them. We began planning in earnest in the fall when students first returned to school, and chose to have our safety fair in May, giving us most of a school year to plan for it. We scheduled our fair to happen close to a school vacation, and at a time when it would not conflict with mandatory testing or exams. By hosting a fair in the spring, presentations can happen outdoors comfortably, too. If a date almost works well but overlaps a period when some teachers like to give pre-tests or other important study-related assignments, consider reaching out ahead of time to invite that they be rescheduled. Make sure the event gets on the school calendar and send frequent reminders to teachers, so they keep the date free of tests or field trips. A safety fair is likely to be held only on a single day, and looking ahead to avoid conflicts will make everyone’s experience better. Many schools mix different grade levels, with middle schools and high schools sharing the same campus. It’s worthwhile to decide which students a safety fair will be most appropriate for, or to make the conscious choice to program the fair to match up with the students’ level of emotional development. 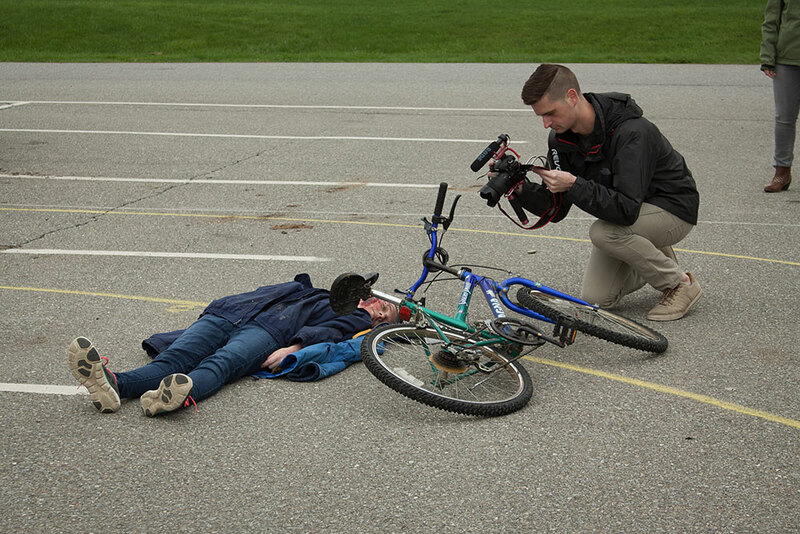 Some programming options can be dramatic or frightening to younger students — a mock crash can have young actors depicting grave injuries, for example. Our fair was geared to grades 9-12. You can also deliberate about whether to invite parents or guests from the community. Some program options can be very interesting to adults, and it could be positive for your whole school community to share the same experiences. But you might also decide that an audience of parents could dilute the student access to the workshops or distract them. At Mt. Abraham we welcomed RSVPs from community guests, hoping to share the results of our effort to contribute to Vermont’s safety messaging. Our guests checked-in at an information table at the entrance to the school (more about that, below). The students’ view of a mock crash at Mt. Abraham. Photo by Leeya Tudek. Will your fair be a half-day or a full day? Will kick-off and wrap-up events bookend it? Only your team will know what’s comfortable and possible for your school, when everybody there has weighed in. There’s no right or wrong way, and a safety fair of any size and shape will be an important way to share a message about safety. The mock crash at Mt. Abraham was very realistic. The actors were true to their storytelling and the effect was emotional. Photo by Leeya Tudek. At Mt. Abraham the school has a close relationship with the Town of Bristol’s first responders. 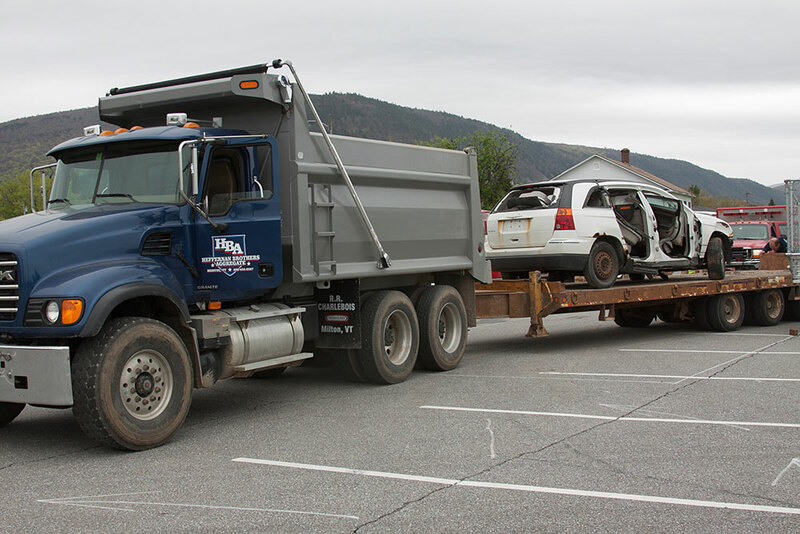 The school invited the police, fire and rescue squads, along with community members who could tow vehicles, to present a dramatic ‘mock crash’ in the morning. 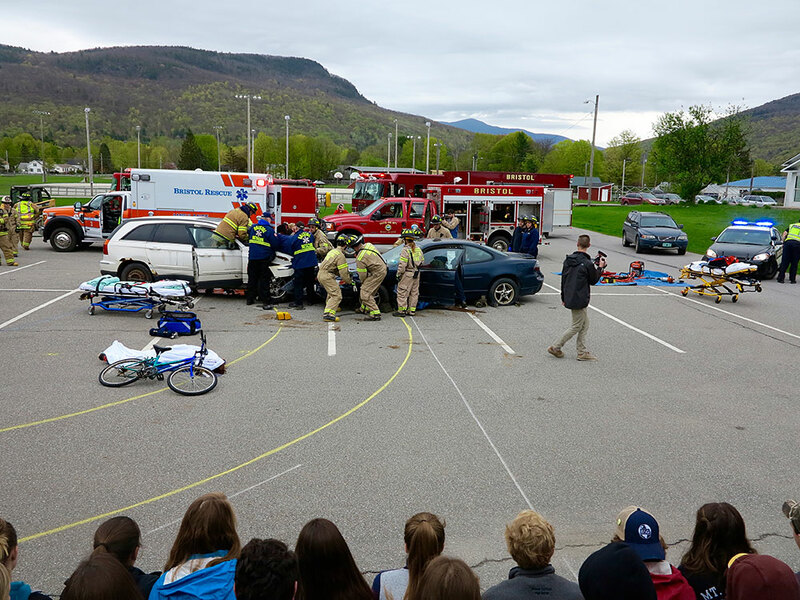 Bleachers were brought to a parking lot and all the students were present for a live reenactment of the aftermath and response to a distracted driving-caused crash. 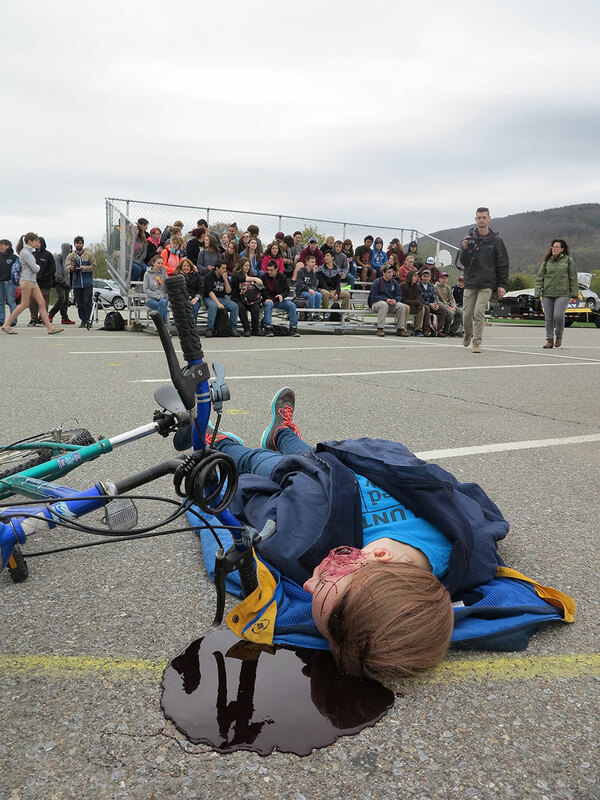 Students with stage makeup acted as injured drivers, passengers, and bicycle riders. A knowledgeable community member narrated the actions that the first responders were taking as they arrived on the scene, assessed it, and gave care to the injured. 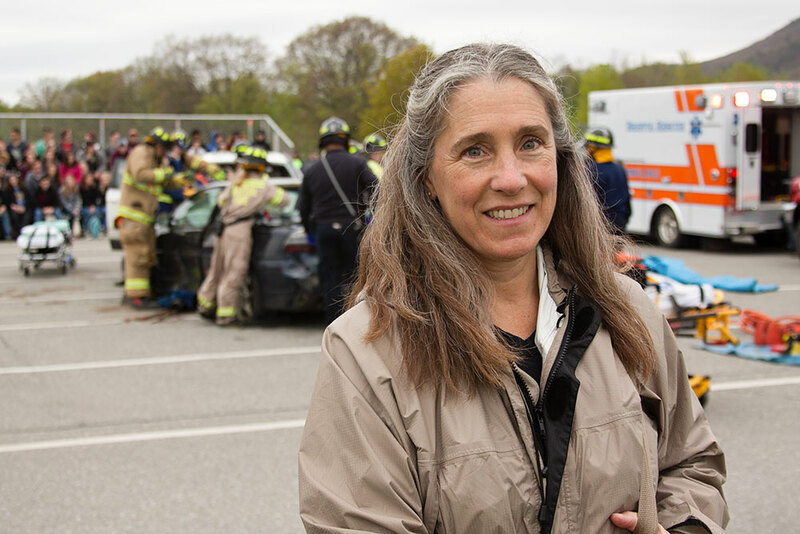 The jaws of life were used to cut vehicles open and parents (acting) — bereaved at the scene of their children’s crash — were comforted by the police chief. The mock crash was the forum for our State Attorney General to make a statement about safety. 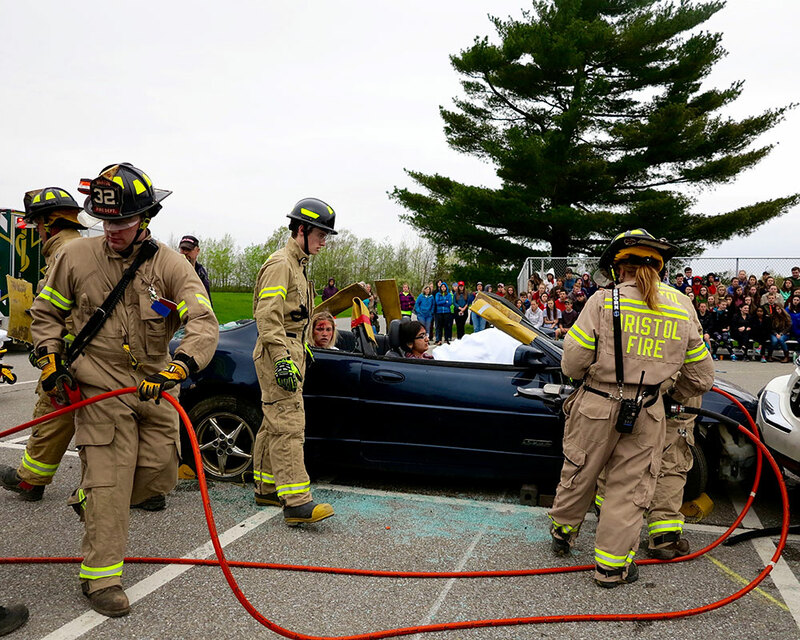 The mock crash was a big ‘kick-off’ event at our fair. A follow-up discussion helped make sure that students held on to the educational benefit of exposure to the mock crash. 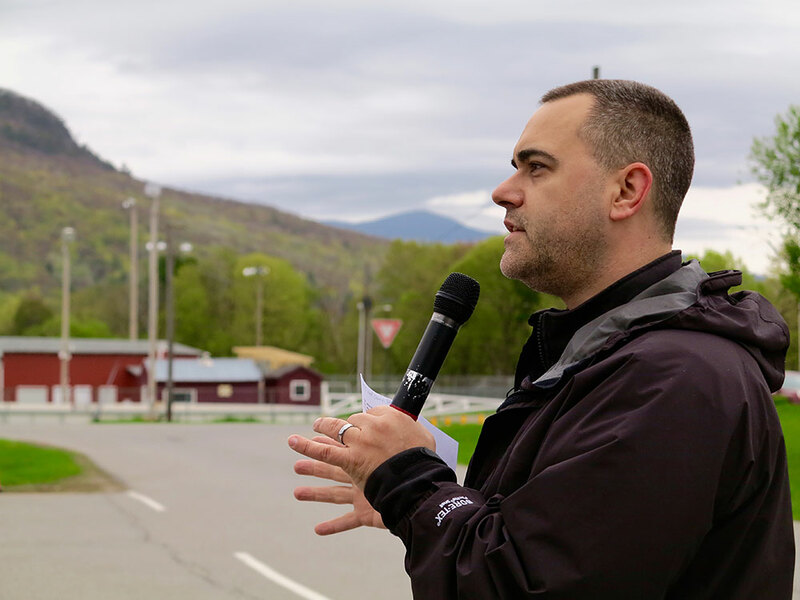 The mock crash was narrated by Matt Tatro, a Mt. Abraham teacher and Shelburne police officer, who explained the actions of each first responder. Photo by Leeya Tudek. Mt. Abraham chose to bring all the students together at the very end of the day, too, for an assembly. The principal spoke, and prizes were raffled off (more, below). The assembly brought the students together to help process what they saw throughout the day, and the prizes helped conclude the fair with a positive energy. Workshops and presentations can be about many safety themes. At Mt. Abraham, topics included fire safety. Photo by Aiden Brunola. Your group will be faced with many choices about which speakers, workshops, and presentations to include in your safety fair schedule. The Youth Safety Council publishes a list of free safety programs that welcome your interest, and you’re likely to have local champions of safety — or individuals who were the cause or victims of a crash — who might contribute their talent or wisdom. You’ll probably find it convenient to share the task of extending invitations among your planning team members, and know that each person will have to follow-through with confirmations and gathering important information like how long a presentation is or how much space should be reserved for it in the parking lot. For an example, here’s our final schedule of presenters and an email sent to a presenter to help clarify and confirm their presence. Our team drew and shared a map of the parking lot to help organize the outdoor presentations, which included big trucks, new cars, the golf cart Turn Off Texting demonstration and the mock crash. Norman James presents Alive at 25, a a young driver’s awareness course designed by the National Safety Council. Photo by Leeya Tudek. Most or all of your presenters will be participating without expecting to be paid. You could think about how to make them feel appreciated, by offering a free lunch or a small gift. Consider that these costs might become part of a budget that you seek community support for. ‘Safety’ is a challenging theme to capture in a compelling event title. We tried a few, exploring how to preserve gravitas while still being positive and compelling. The process of giving your fair a name will challenge you and your students, too — something to look forward to as one of the more creative tasks you’ll face! A safety fair can engage students on many levels. When they’re attached to it creatively or it becomes an investment in their success at school, the experience becomes even more memorable. Our planning group thought hard about how to connect our fair to curriculum, to make it an even more enriching experience. 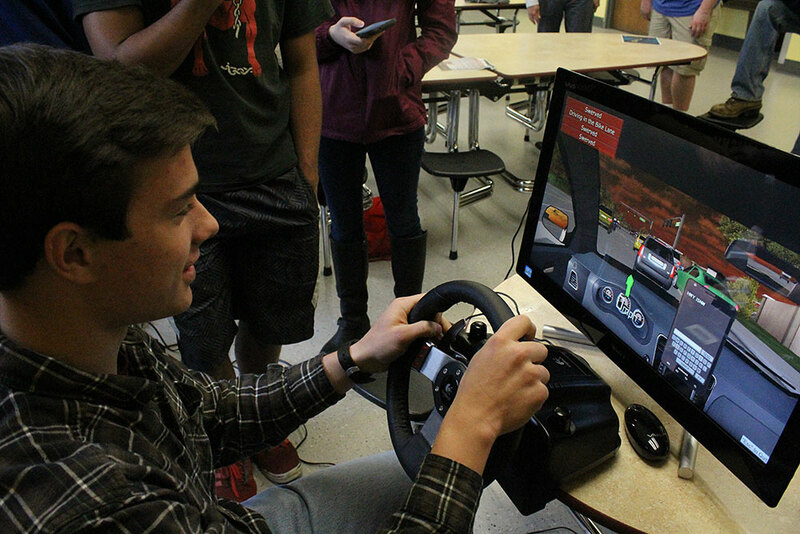 Simulators from the VT Department of Health and the UVM Medical Center helped students learn about the dangers of driving while distracted. Photo by Aiden Brunola. Vermont has driver education learning targets. They include, “CLT 6: I can make healthy choices and take responsible action in regard to chemical, physical and psychological conditions affecting my performance (such as substance use/abuse, sleep deprivation, fatigue, distractions and other emotional factors), “and “VLT 15 I can minimize risk by making healthy choices to enable safety for all Highway Transportation System Users by having a risk prevention and space management mindset.” View a list of these driver education proficiencies. Vermont has Health and Habits of Work learning targets that a safety fair can contribute to as well. As you explore how your safety fair can connect to curriculum, we’d be grateful to learn what you discover. Sergeant Tim Gould of the Vermont State Police demonstrated how crash scenes are reconstructed, and how central math is to the job. Photo by YSCVT. A curriculum sweet spot at Mt. 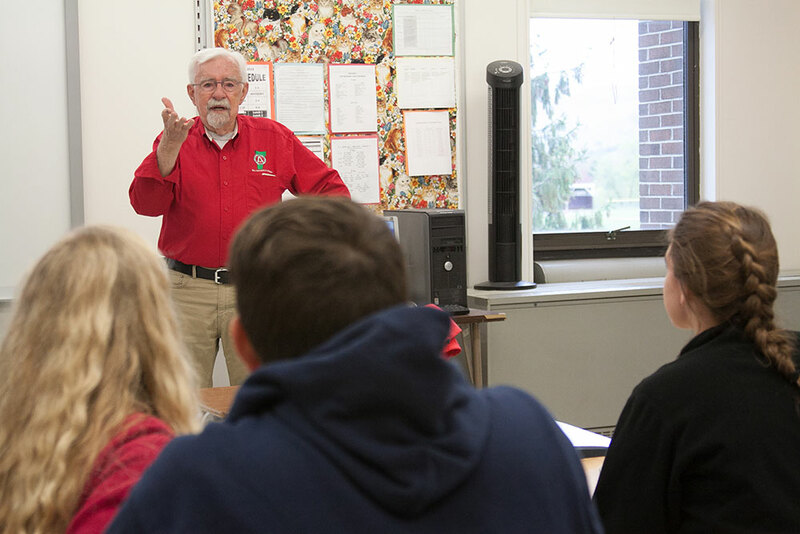 Abraham was a class called Age of Legality — a course that helped students understand how to become active and engaged participants in public life and explored the rights and responsibilities of adulthood and citizenship (see the national standards for civics). Students from Mt. Abraham’s Age of Legality class served as key volunteers in producing our safety fair: As an ambassador for each workshop; documenting them; gathering feedback from their peers; and acting as an assistant. They played a role in making their whole student body safer in general, and this fit right in with their class objectives. Volunteers and community supporters helped document the Mt. Abraham fair, including the mock crash and its realistic crash victims. Photo by YSCVT. There are obvious connections between a fair as a big campus event and photographers and writers from the school’s newspaper and yearbook staff. 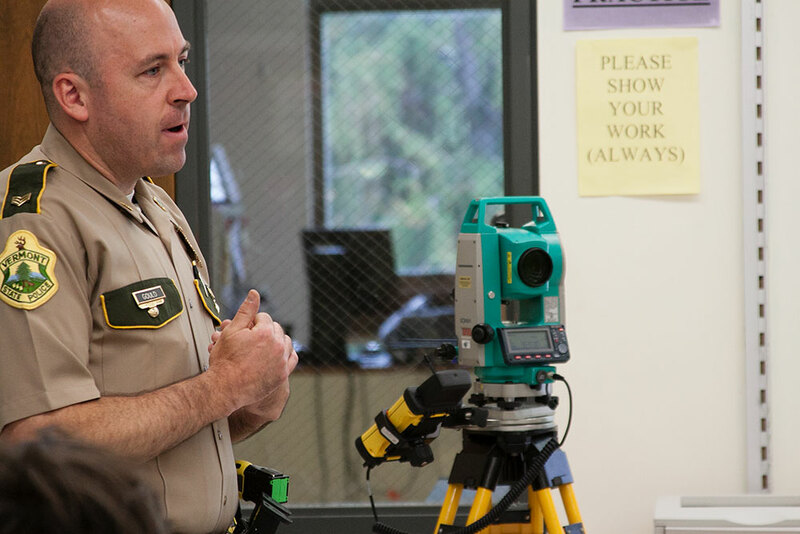 Presentations might tie in to more specific classes, too, like the Vermont State Police crash reconstruction team and a math class. The more your team creates roles and responsibilities for students, the more potential you’ll create for a lasting impression. During our fair, we had 25 workshops in four different time slots, serving 400 students. At this scale, we needed about 25 student volunteers and 35 adults. We had one student and one adult volunteer ‘host’ in each workshop. 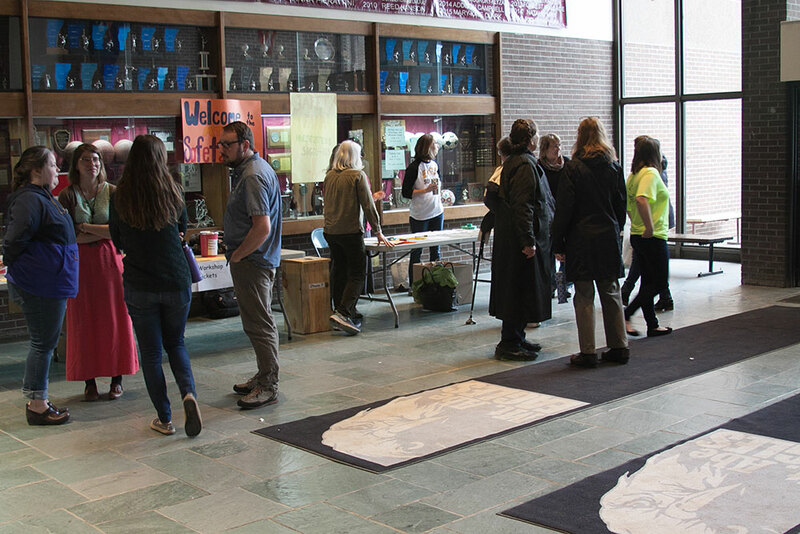 The adults helped monitor halls during transitions between workshops; they staffed the information table at the entrance to the school, and they chaperoned workshops. The student volunteers had a guide to follow that outlined their responsibilities, which included greeting and chaperoning presenters to their rooms, taking photos, and collecting feedback from students. Before a sign-up process was launched, students were given a chance to preview the posted workshops. Mt. Abraham used an online sign-up tool that was meant to help streamline the process, but difficulties were encountered when re-scheduling was needed, so we can’t offer a firm suggestion to use an online service. 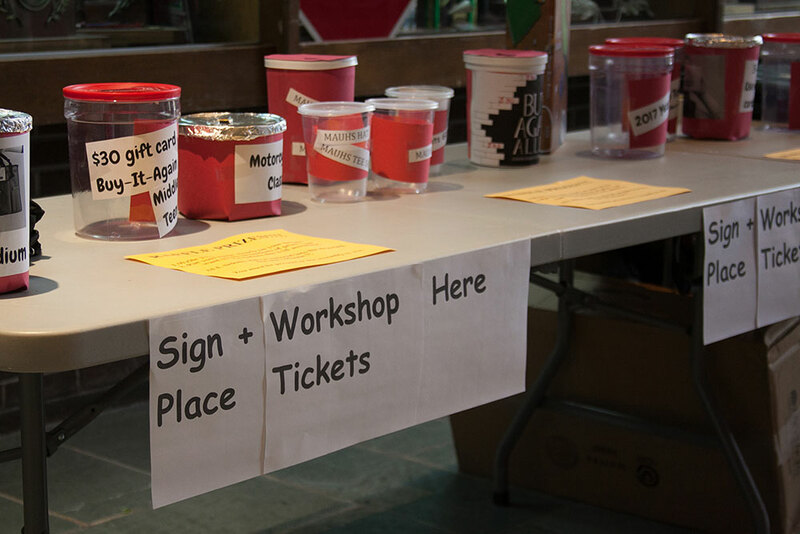 A paper-based sign-up system could work well with a small number of workshops. Your team will likely make the decision to use paper or a service like SignUpGenius. Here’s the paper version of the safety fair schedule that Mt. Abraham students filled out to help manage their day. The important objectives are to be able to give students a choice of workshops based on their interests, and to be able to ultimately generate lists sorted by student or by workshop. Our team learned that it’s important for teachers to encourage students to sign up, avoiding a crush near the deadline and helping the planning team learn how the schedule might be adjusted to accommodate popular interests. Along the way you’ll be creating art and language that will help people know about and navigate the fair. A press release will be a key tool for sharing an overview of the fair and showing the commitment of everyone involved. A press release will be a platform for bringing exposure to your event supporters by mentioning them, which makes their sponsorship more valuable. Our group planned ahead to take a group photo at a planning meeting; including a photo (especially one that includes students! ), makes your information more compelling to newspapers. The basic information can be given more ‘human interest’ by including brief quotes. Here’s the Mt. Abraham press release. At Mt. 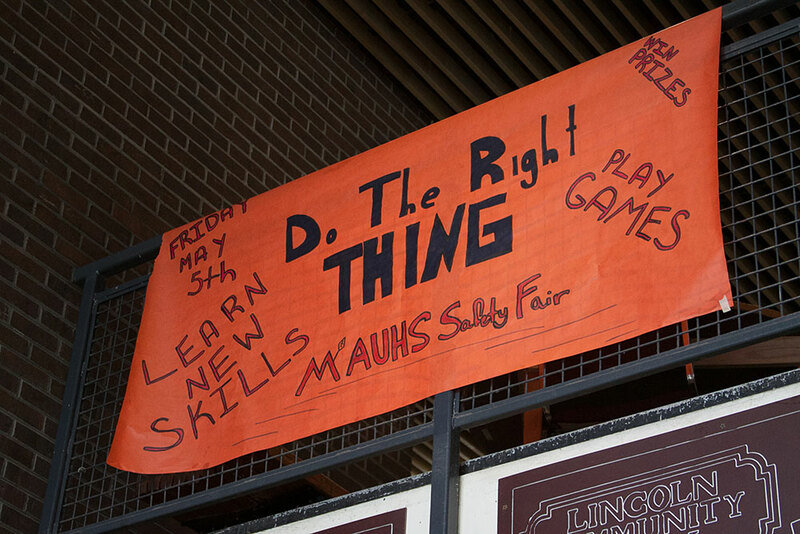 Abraham, the safety fair was titled ‘Do The Right Thing’ and promoted at the main entrance to the school. Photo by YSCVT. Our students created logo art for bright safety-yellow t-shirts for volunteers to wear, and a big banner promoting the fair that hung from a balcony over the entrance to the school. You’ll need signs for your info table and the doors to each workshop, and to guide people through the halls. Students designed the Mt. 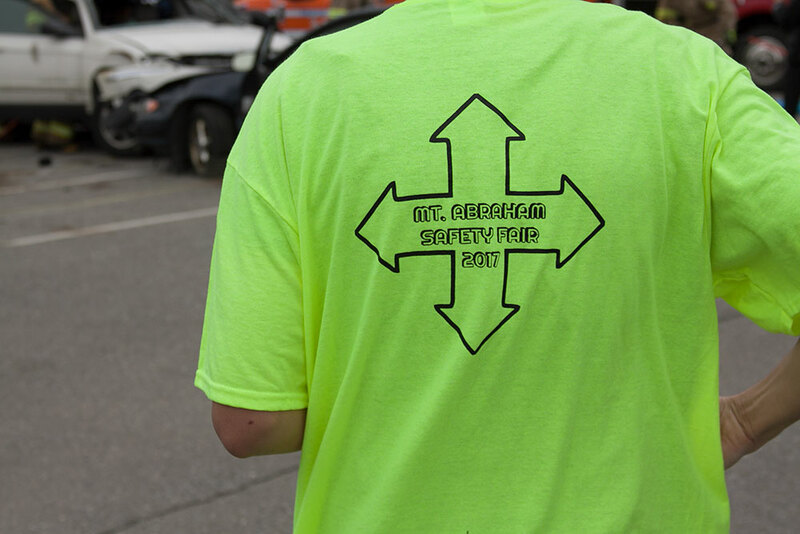 Abraham safety fair identity and community support funded t-shirts for the volunteers. Photo by YSCVT. A package that includes a schedule and a description of each workshop or presentation will help everyone find their way through the day. Here’s the one used at Mt. Abraham. The safety fair information table at the main entry to Mt. Abraham. Photo by YSCVT. At Mt. Abraham, the info table at the school entrance was the fair’s operational headquarters. A student attendance sheet was kept there, and maps to room locations and presenters, the guest sign-in form, and info packets for presenters and guests. Students had prominent roles in the Mt. Abraham safety fair as ambassadors and spokespeople. Photo by Aiden Brunola. You might have a student willing to be a spokesperson for the fair. They could be a contact for the press and present about the fair to your selectboard or legislators. It’s helpful to have several primary contacts — adults and students — during the fair who the press or guests can be introduced to for hospitality and help getting oriented. For us, press included newspapers and local talk radio programs. Sharing word of the event to the media was natural for the Mt. Abraham planning group — we were hopeful that our work to inspire a safer culture would echo usefully through our community this way. Your group will come to its own decision about whether to seek the interest of the press. Here’s the Mt. Abraham press release, and the exposure it generated in the Addison County Independent. The press release can be sent to more than just your local newspapers and radio stations — it can be used as a tool to start conversations with potential sponsors, before it’s finalized and sent to press. If a sponsor steps up to help, they’ll want to be included in it when the press release is eventually delivered to media. The press release will be a tool to connect with civic leaders, too, making them aware of how innovative, caring and creative your school’s community is. For all the work you put into the safety fair, you deserve to be in the forefront of the thoughts of your city and state leadership! Promoting the safety fair creates opportunities to share a general message about safety; wherever the safety fair and its mission is mentioned, someone is exposed to this message and a little bit of good is accomplished. Consider making a Facebook event page for your fair, and posting about it to the newsletters of your school, your town government, or neighborhood email groups like Front Porch Forum if you have one. Ask your community partners — like the police and fire departments — to share your event info on their web sites and social media. Be sure the Governor’s Highway Safety Program knows about it via email, too — they might help spread the word! Raffle tickets were given to students at each workshop, and winners were drawn at the closing assembly. Photo by YSCVT. Mt. Abraham chose to close the day with an assembly attended by all the students. It brought them together to hear statements that were meant to help them think about how important safety is to each person and to each other and to integrate the day’s experience. Throughout the planning process, your group can be reaching out to your community to ask for prizes to give away at an assembly. By passing out raffle tickets at each workshop, then requiring that students be present to win, attendance is incentivized. At the Mt. Abraham assembly, prizes included a motorcycle riding course and an iPhone. Each workshop room could have instructions for its volunteer, an attendance list, raffle tickets (if you’ll be giving prizes away), and index cards for feedback from students. 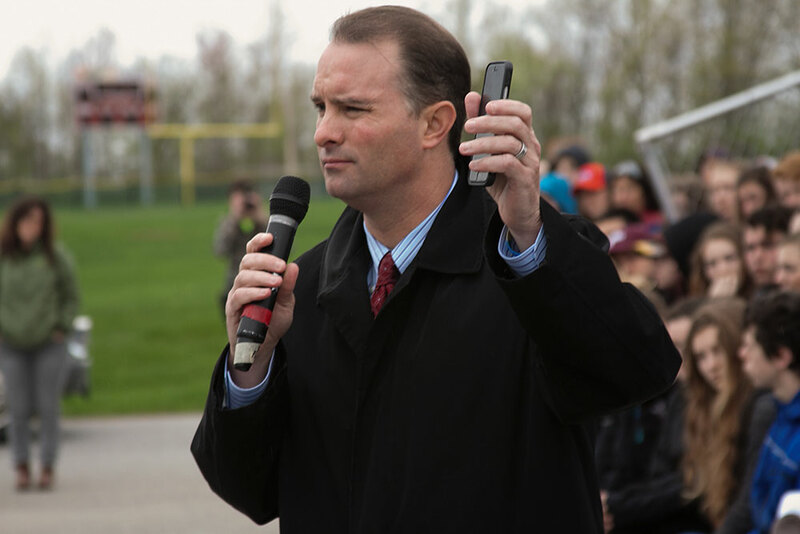 Vermont State Attorney General T.J. Donovan spoke to Mt. Abraham students during the mock crash presentation. Our team also discussed how valuable it can be to invite a local speaker who would have a story or experience to share that others from your region would empathize with, or feel close to. It might be convenient for a local person to join you again at a later date to speak to individual classes, becoming a resource to the school. You might want to send a ‘save the date’ message to legislators, your school board, and local and state officials when you first draft your press release. Be sure your school administrators support your effort to invite a legislator or state leader to campus, too. Businesses supported the Mt. Abraham safety fair by donating services and cooperating with one another to help provide all the assistance needed for some of the presentations. Your planning might lead to choices that require funding, like having t-shirts for your volunteer crew during the event, providing a meal to your presenters and guests, or having special prizes that can’t be donated. By planning far enough ahead you’ll be able to apply for helpful grants, like the Small & Inspiring Community Grant Fund program at the Vermont Community Foundation, which offers “$500-$2,500 grants to organizations statewide to support work that builds communities.” You can approach local businesses to ask for financial support or donations of prizes or even food to serve at lunch. Your safety fair can help bring your community together which will make everyone feel good, so don’t feel shy about asking! The Vermont Community Foundation also provides a directory of grants that are available in Vermont from many different funders. Heritage Toyota has also created a grant program to help Vermont schools produce safety fairs where there’s a focus on teen driver safety. For any schools who would like to offer a safety fair in the 2017-2018 academic year, Heritage Toyota is offering a $250 grant. To ask for a Heritage Toyota safety fair grant, visit www.heritagevt.com/donation-requests and fill out the form. Bethany Sargent, Marketing Manager of Heritage Automotive Group told us, “We are so proud to help schools bring important safety information to their students. Being committed to our communities means being committed to the health and well-being of our next generation of drivers. We feel fortunate to be able to get involved and support schools with this endeavor.” Heritage Toyota provides Toyota sales and service and is part of the Heritage Automotive Group. The Mt. Abraham team encountered a few bumpy moments, described below, during our safety fair. We don’t have a plan to offer that would make your ride smoother, but we sure would love to hear of how you choose to address these circumstances; thanks for sharing the wisdom you gain during your own fair production! Some parents chose to allow their children to not attend school on the day of the fair, since the fair wasn’t actual ‘classes.’ The fair programming was important and interesting and would have benefitted those students if they’d been on campus for it. We learned that it’s important to reach out to parents ahead of time so they know the value of the event. Our fair was comprised of different presenters, traveling from many organizations. Every presenter had a different communication style or aptitude, and sometimes communication with the planning team was of challenging quality or not timely. We learned that communication needed to happen frequently, and that it was a big job that should be shared by more than one person. Cancelations are not just possible, but likely. Organizations might have vehicles break down and require replacement by the trucks that were intended to be part of a presentation. Presenters might find themselves short-staffed in more critical departments and have to adjust by withdrawing personnel from the fair. Weather might force students indoors. These are situations you should be prepared to adapt to. Having empty indoor spaces available as a contingency for relocating — or noting which indoor workshops have extra space that more students could join if any programming is canceled — will help your event roll forward smoothly. At Mt. Abraham we asked our student volunteers, who were stationed with every workshop and presentation, to take photos and gather feedback on index cards. This helped us document our experience to share it with you, and gave us a resource that will help us make an even better safety fair the next time. You could plan to document your fair, to celebrate it and remind your students how successful and empowered they are, for helping influence each other so positively. Our team sent a follow-up announcement to the press, describing the actual events at the fair and including photographs. The Addison County Independent very kindly published a photo story about the Mt. Abraham fair. Thanking your event supporters can happen with signs and banners, statements by speakers, and in your press release. Photo by YSCVT. You may want to thank the presenters who spent time with your students, for donating their hours and sharing their knowledge so generously. If you’d like to have a conversation with one of the Mt. Abraham safety fair planning team, feel welcome to contact us! Contact Mt. Abraham teachers by phone at (802) 453-2333. A self-defense workshop. Photo by Leeya Tudek. The YSCVT Turn Off Texting demonstration. Photo by Aiden Brunola. The Mt. 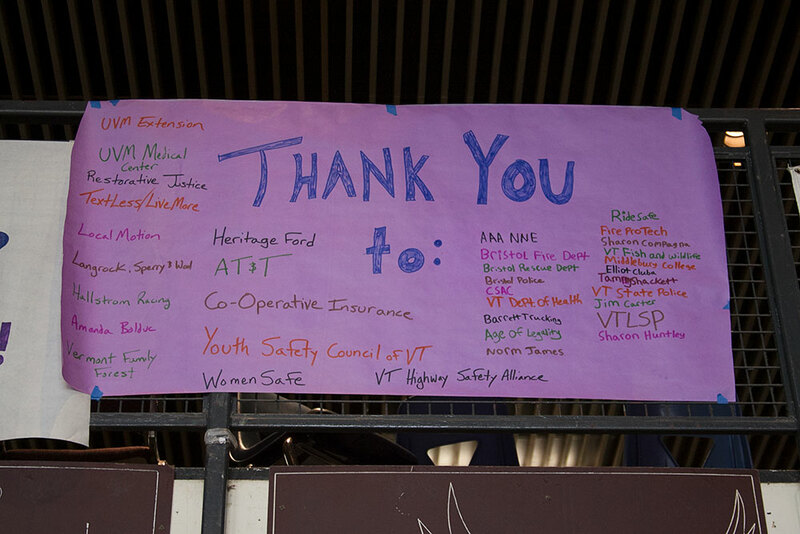 Abraham safety fair was made possible with community support and dozens of volunteers and community organizations, who all deserve thanks and acknowledgement for their generosity and dedication to the wellbeing of our young people. The team sends special thanks to Heritage Toyota for capturing the event to video and sharing it with the public; to Co-operative Insurance Companies for their financial sponsorship, and to the many colleagues at Mt. Abraham UHS and Vermont’s statewide safety community who guided and helped us. 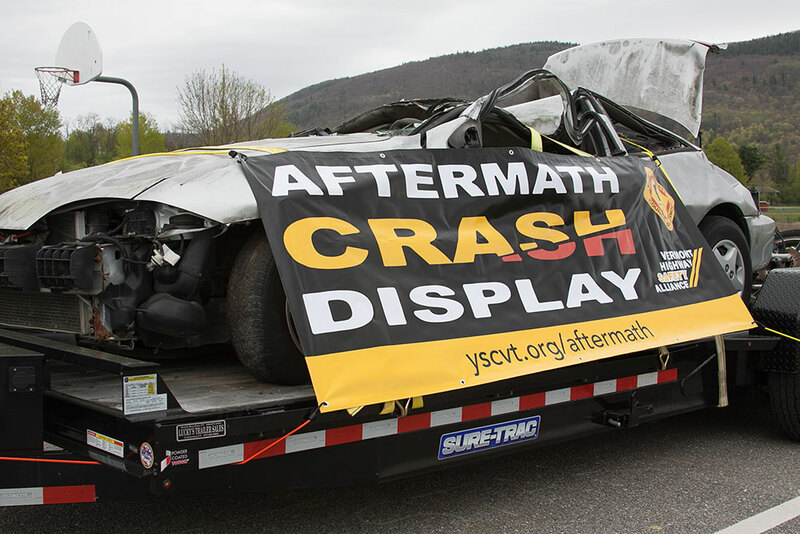 Our work was inspired by the Vermont Highway Safety Alliance which brings safety-minded collaborators together from all over the state to reduce major crashes and their tragic consequences. The team also recognizes — with respect and gratitude — the leadership of Sharon Koller, whose focus, dedication and unwavering positive energy was the foundation of our successful fair. Sharon Koller, our planning team leader.